In the recent years, Fender came up with some new stuff in their acoustic guitar line. They’re refining their acoustic lining, and they’re kind of setting it up in segments. The 300CE falls under the California series. The idea is that they’ve taken some classic guitars and they pulled them out of their classic series and gave them some ‘West Coast’ flavor when it comes to the design. The headstock is a little bit bigger than the headstocks on their classic series and the inlays all have a great design which looks amazing. The bridge of this guitar is kind of a mustache-shaped bridge which Fender likes to call ‘Viking Bridge’. 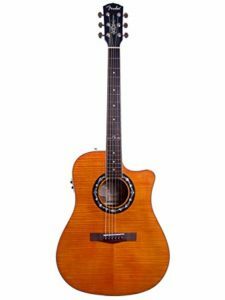 This guitar features an all laminate construction so, it has laminate mahogany back and sides, with a laminate flamed maple top which continues up to the headstock. This guitar comes in 3 colors: Sunburst, Moonlight Burst & Cherry Burst. I think that all of them look great, but the current one we are reviewing is definitely my favorite one. In addition to the look of this line of guitars, Fender has done some changes under the hood as well. Since it is a laminate construction guitar, it features scalloped bracing, so that it’s a little bit resonant than it otherwise would be. The tuners on the over-sized headstock are very sturdy and they feel really nice. Some lower-end guitars have tuners which feel like they are about to break at any time. You won’t have that problem with the T-Bucket 300CE. What i like the most about this guitar is that it has a good sized body & it’s got some nice depth to it on the low end given the body size but its too big, it’s still really comfortable sitting in your lap. 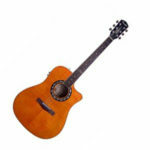 The guitar itself has a slim C-Profile on the neck and it has a 25.3 inch scale length. They’re using graphtec new bone saddle and nut. The radius of this guitar is just a little bit rounder, it comes under a skosh 12 inch radius, whereas most of Fender’s acoustic guitars are 12-inch radius, so it feels a little bit rounder on the hand, particularly when you are doing some cords. 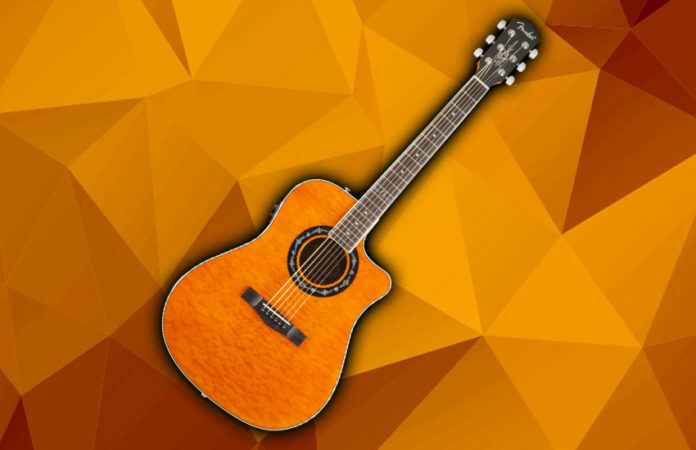 I personally think that this guitar is designed for someone who likes that rock-and-roll feeling and plays electric guitars often, but wants an acoustic guitar to complete their guitar set. Overall, i would say that this guitar has some really nice things to offer to you. It can be a great fit for beginners, intermediates and electric guitar players. The thing i loved the most about the guitar is the design. Finding a guitar that looks and performs great at the same time is not an easy task, so Fender definitely made it easier for people that love these kinds of guitars.